“I can’t hit the ball on the course as well as I can on the range…I’ve won several U.S. Opens on the range…I’m a scratch golfer on the range but a 15 on the course…” These comments have been made by innumerable golfers over the years. It’s one of the great mysteries of the game: How can someone hit the ball so well on the practice tee and yet so poorly on the course? Why do people lack the consistency on the course that they have on the range? Fortunately, there are solutions to help our students with this most perplexing of problems. We must consider that the game as played on the course is completely different than what is happening on the range. On the course, we hit one shot every few minutes, and we’re using a different club each time (except for putting). A normal driving range session consists of using the same club for several consecutive shots, with little or no break between shots. On the range, most people are using what is called a massed and blocked schedule. Massed means taking virtually no time between repetitions, and blocked means doing the same thing over and over. On the course, that schedule changes to distributed and random. Distributed means taking time between repetitions, and random means that something about the activity changes from repetition to repetition – different distance, direction, club, etc. So right off the bat, people just aren’t practicing the same way that they play the game, not to mention they aren’t practicing on the same venue. In other sports such as baseball and basketball, practice sessions take place on the actual playing surface, but in golf we practice on a practice green and a tee box. Use a distributed and random practice schedule. Motor learning research shows us that a massed/blocked practice schedule will give us the best practice results, while ironically, a distributed/random schedule is best for retention of skills and performance, even if practice performance isn’t as good. Most people would think getting into a groove on the practice tee by hitting the same good shots over and over will lead to superior results on the course, but this isn’t the case. Utilizing a distributed/random practice schedule on the range isn’t difficult. Our students need to change clubs with each shot and take their time between shots. Instead of having the bag right next to them, they can place it five to ten yards away so they have to walk back to the bag each time to get another club. This will help with the distributed portion of a practice session. Around the practice green, this means either using a different club each time, or at the very least, a change of targets from shot to shot. Visualize on-course situations on the range. Along with utilizing a distributed/random schedule of practice, it’s extremely helpful to visualize on-course situations on the range. Students should not only “see” a hole or a shot situation, they should also “feel” the situation. In other words, they should mentally place themselves there. Golfers who do this may be surprised at how their on-course mentality permeates their on-range thinking, which may lead to poor range shotmaking, but this is beneficial so they can learn to handle these mental aspects when they play. Some teachers like to recommend that their students “play” a hole or holes on the range, and this is an excellent way to take this to the ultimate level. Use the same pre-shot routine on the range and course. Most golfers do not use the same pre-shot routine on the range as they do on the course. It therefore becomes difficult to find a decent rhythm and sense of mental comfort on the course if someone is not using their on-course routine in practice sessions. Golfers on the range tend to rake-and-hit, rake-and-hit, while on the course they take far more time to hit a shot. It’s not necessary to use the same routine for each practice shot, but it should be used at least half of the time. Golfers who use a distributed/random practice schedule, visualize on-course situations and faithfully use their pre-shot routine on the range and practice green will find that it will become far easier to take their practice performance to the course. Unfortunately, this is not commonly done today, but with our help, our students can be at the forefront of a practice revolution that one day may be commonplace in the game of golf. 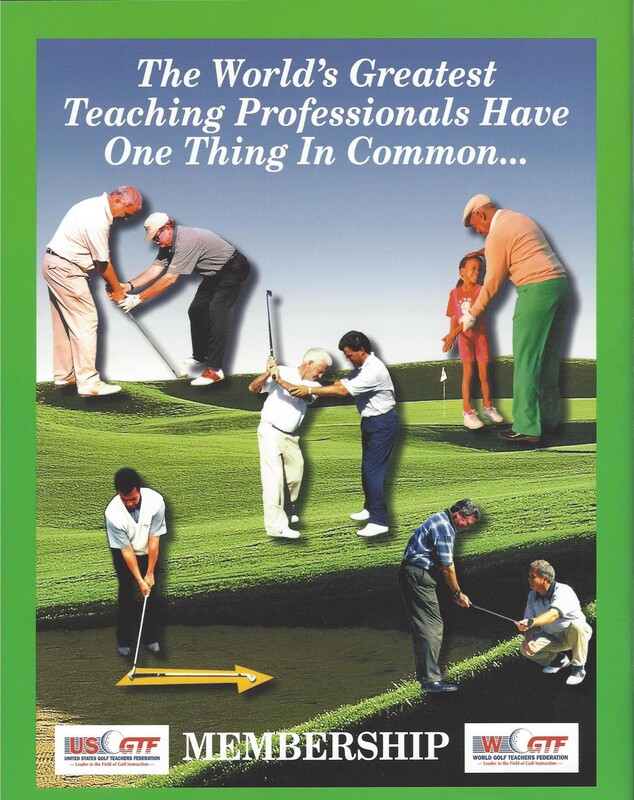 …there are strategies to make practice more effective and mirror what is happening on the course, and we as teachers need to be aware of these.